HSMAI produces online courses in Revenue Management, Sales, Account Management and Digital Marketing. We also partner with other reputable institutions to negotiate discounts for our members on courses and conferences. Checkout HSMAI Academy for more information. 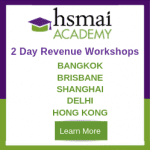 HSMAI runs regular Training Workshops in 10 cities in Asia Pacific which are free for HSMAI Members. Check-out our schedule on our Events page.